Where do I use my I want one of those voucher code? 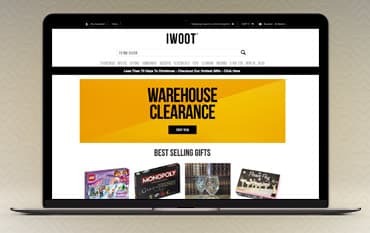 Browse for the deal or code you wish to use on the NetVoucherCodes ‘IWOOT’ page, click it and follow our link to their site. Browse through the enormous collection of quirky gifts and gadgets and select the items you would like to buy. Once you have finished, click through to the basket page and add your voucher code to the box provided and click 'Add'. Follow the payment and shipment instructions and finally complete your transaction. You can find amazing deals and discounts on items across the I Want One Of Those stores. Find great unusual, geeky and retro gifts all for reduced prices as well as electronics, homeware and kitchenware. Get ready for Christmas with great stocking fillers- buy 3 for £20. And give the best gift on birthdays when you buy an eccentric gift from IWOOT. Shop at I Want One Of Those and find great products in home and garden, gadgets and technology. I Want One Of Those (IWOOT) has a fantastic range of cool and quirky toys, gadgets and accessories for all ages, as well as gifts for him and her, for birthdays, for geeks and for kids, including things like novelty gifts, experience days, barware, food and drink, star wars merchandise, Pop! Vinyl!, Lego and scented candles. You can even find gifts for occasions such as weddings, birthdays and Christmas as well as special deals for Cyber Monday and Black Friday. The 3 for £20 section at I Want One Of Those lets you find great products and gifts for great value for money. Maybe you have a 18th, 21st or 30th birthday coming up in your family? Maybe you're just after some quirky kitchenware for a couple of newlyweds looking to fill their new home with characterful home ware - either way, IWOOT has got it covered. They stock all kinds of great products that are unique and exciting for people who want something a little different. And with 3 for £20, you can now buy more for less! Gifts at IWOOT are available for him, her and kids. For him, you can find gifts such as Lego Star Wars advent calendars, plug and play retro TV games and glass globe whisky decanters. For her, there are gifts such as scented candles, cute parlance jars with LED lights and Lumee illuminated mobile phone cases. For kids, you’ll find gifts such as Batman Bat signal flashlight keychain, bubble machines and Bazooka water guns. To register with IWOOT please fill in the form provided here. You have 14 days after the date of delivery to return a product to IWOOT. How can I contact IWOOT? If you need to contact IWOOT please use the contact form which can be found here. I want one of those sells a whole lot of things, but really, they just sell one: fun stuff. There are toys for big kids and little ones, board games and quirky beer glasses, DVDs and Blu-ray box sets, eccentric items for home and garden, thrilling experience days, gifts for him and gifts for her, and a gaggle of gadgets for any occasion. I want one of those stock themselves to the rafters with a catalogue of strange and wonderful things, and with free delivery on all UK orders, your package full of fun will be at your door before long with a minimum of fuss. At NetVoucherCodes we know how great it is to get something fun in the post, and we also know how much better it is to grab it at a saving. So if you’re looking for an IWOOT discount code or a deal listing, we’ve got a bunch of hot tips for you.